Tag dinnerware made by Tag LTD is the amateur decorator's dream come true. Tag's vision is "to bring well-designed, stylish and affordable products into the home of every consumer". What does that mean for us? 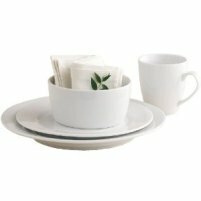 High-quality, fashionable, casual dinnerware sets at a great price! 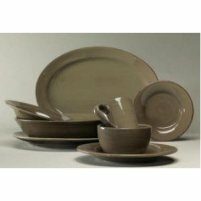 Sonoma dinnerware by Tag is one of their most popular dinnerware patterns. It is ironstone, hand painted dinnerware that is available in nine colors: slate blue, celadon, terracotta, yellow, red, tan, ivory, chocolate, and olive. It is sold in open-stock which means that you can mix and match the colors rather purchasing a whole set in one color. Tag whiteware is also very nice. It is made of white porcelain and it is simple, not too elaborate. The dinnerware pieces are very practical and there is a wide variety of serving accessories that match the whiteware dinnerware. I especially like the 3-tiered stand with bowls. I wish I could find one of those to match my casual dinnerware set to use at parties. The Seafoam Dinnerware Collection by Tag is ideal for nautical décor if you like the green, ocean tint. It is somewhat rustic dinnerware made from terracotta.